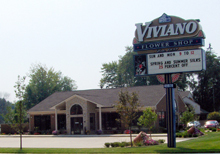 Viviano Flower Shop is a local Michigan florist with five Metro Detroit area retail locations to serve you: St. Clair Shores, Shelby Township, Chesterfield Township, Grosse Pointe Woods, and Rochester. We also stock the Viviano Flower Market inside Vince & Joe's Gourmet Market in Shelby Township. Viviano's is a family-owned flower shop, providing beautiful fresh flowers complemented by outstanding service and value since 1937. St. Clair Shores is our main location, and we have four branch stores: Shelby Twp., Chesterfield Twp., Grosse Pointe Woods, and Rochester. The Viviano Flower Market inside Vince & Joe's Gourmet Market in Shelby Twp. is not staffed by Viviano's and does not share our hours. These hours apply to all stores (not including Viviano Flower Market) unless specified otherwise. thus, we can still make deliveries during main store hours on days when only branch stores are closed.